The New Hampshire Primary is the first Primary in the nation for the 2012 Presidential Election nominating process, and it takes place tomorrow, January 10th. 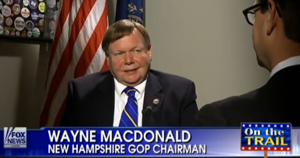 Wayne MacDonald, Chairman of the Republican Party of New Hampshire, went "On the Record" to explain why the New Hampshire Primary is so important: "New Hampshire has long been an effective vetting venue, if you will, for the presidency of the United Sates for decades and decades. We have looked the candidates square in the eye, shaken their hand, met them in living rooms and backyard barbecues. We've asked them the tough questions and we've thoughtfully made recommendations to the rest of the country, and toward that end, no one has gone on to be president if they didn't finish at least second in the New Hampshire Primary."